15/52 Les Winan Great work by the cast in this well-made, painful to watch film that ultimately collapses under the weight of itself. Just not a fun experience. 22/68 Michael Bentley The acting is great and it is technically impressive, though emotionally draining. 23/200 Max Braden Effectively painful to watch. 57/65 Kim Hollis Dull, self-important, and grim. Just as contrived as Crash, but with no hope. 129/159 David Mumpower Crash wannabe does nothing but tell sad, pointless stories. It's self-indulgent and not the least bit entertaining. Easily the worst Best Picture nominee. In both Amores Perros and 21 Grams, director Alejandro Gonzalez Inarritu (try saying that three times fast), weaved together several interlocking dramatic storylines in a nonlinear fashion. These were raw, emotional films dealing with aspects of the human experience. Both of those were critical hits and were nominated for three Oscars between them. With Babel, the artiste is back at it again. 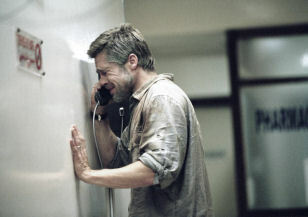 Brad Pitt stars as Richard and Cate Blanchett is Susan, a married couple struck by tragedy while on vacation in Morocco. But that is just one of the storylines, as Babel also visits Tunisia, Mexico, and Japan in what is sure to be a visually arresting and emotionally draining experience for viewers. Gael Garcia Bernal, whose breakout role was in Amores Perros, also stars. Guillermo Arriago, whose work includes Perros and 21 Grams, wrote the script. See the latest developments for this project on the Babel Movie News page.